From now on, in PvP, PvE and Co-op modes in ‘trophy search’ after the battle you can find such rare resources as neodium and beryllium needed for construction of destroyers. To get the right resources, pilots need to take into battle fully levelled ships of the same rank as the destroyers they plan to assemble. Also, now destroyers can not only repair allies in battle but also themselves! 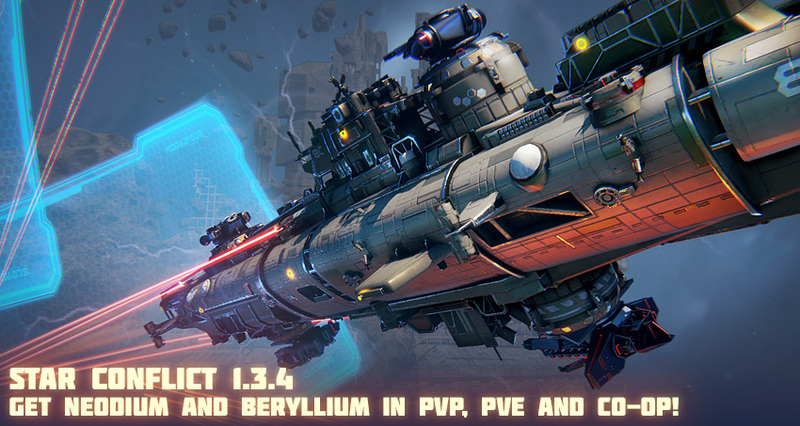 From now on, in PvP, PvE and Co-op modes in ‘trophy search’ after the battle you can find such rare resources as neodium and beryllium needed for construction of ships. The number of trophy search attemps has been reduced to 2 in Co-op mode. Players with premium licenses still get two additional attempts. Thus, players can get all resources required for manufacturing destroyers by playing all the game modes: PvP, PvE and Co-op. Changed the way of obtaining resources for destroyer manufacturing. One neodium plate now requires 10 ore units. All players with neodium and beryllium ore in storage at the moment of update will have their ore reserves increased proportionally. UMC engineers are offering new repair drones for your destroyers! Pilots can now use repair drones instead of static barriers. After launching the drone starts to restore the hull of the damaged destroyer or an ally within a radius of 300 meters from the destroyer. Heavy repair drones are available to all rank 8 and rank 11 destroyers. 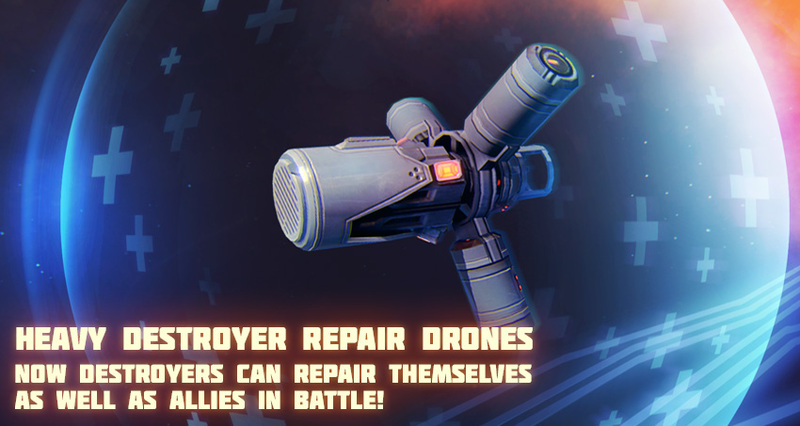 Heavy repair drones can be installed in the slot for rocket ammunition instead of a static barrier. Heavy repair drones are active for one battle. With this update we are significantly changing the system of rewards for participation in corporate battles in ‘Sector conquest’. Now rewards are given out not through game-mail, but for active participation in PvP battles. Each corporation pilot must now choose a reward and get it after winning a PvP battle. Rewards are now handed out through a special token system. Every day, every pilot will be able to receive the reward as many times as there are tokens in locations owned by his corporation. 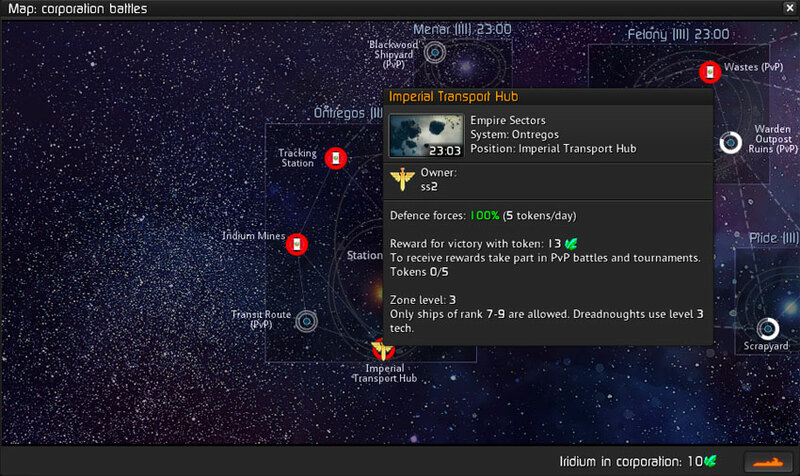 To receive the reward, the pilot has to select a location on the ‘Corporation battles’ map. Then you have to win a PvP battle for any location of the same rank or higher than the selected one. Each victory spends one token and gives the pilot a reward from the chosen location. Each pilot can only see their personal tokens on the map. If a pilot uses all tokens — this is his maximum daily reward. A token is spent after battle only if the pilot wins and gets a reward. If a location has 75+ durability pts., you get 4 tokens per day. In the future, the number of daily tokens available for corporation pilots may be changed depending on the number of owned locations, the player's rank, corporation level and other parameters. Co-op battles from rank 6 to rank 12 will have AI-controlled destroyers. Destroyed ship mark in PvE is now removed as soon as it's restored by an ally. Corporate leaderboards now show pilots with zero rating values. During manufacturing special module parameters now display characteristics with regards to weapons installed by default. Improved ‘safe exit’ open space message. Tweaked AI difficulty in several PvE missions. PvE missions are now divided by the following ranks: 1-5, 6-10, 11-15. Fixed model bug with ‘Osprey’. Fixed model bug with ‘Piranha-B2’. Fixed model bug with ‘Katana’. Fixed a bug in debriefing for Team Battle. Improved several battlegrounds and hangars. Fixed a bug with the ‘Send application’ button for closed corporations. Fixed a disintegrator firing spot on ‘Kraken’. Fixed karma value calculations for kills with drones. Fixed a rare store bug. Fixed a bug with Guided torpedo together with a rank 6 weapon dealing more damage than with a rank 7 weapon. Fixed mirroring stickers on destroyers. Fixed squad queue errors in Co-op mode. Fixed display errors for several achievements. Added energy drain to ‘Static Shield’ description. You can now see premium ship bonuses affecting parameters.